I was washing the car on Saturday, and every time I went into the garage, a bird flew out of the rhododendron bush beside the garage door. It took me a while before I got curious. 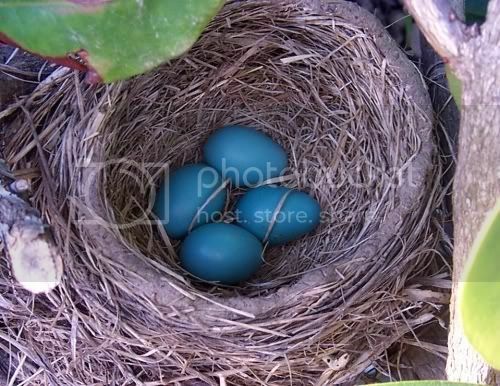 Sure enough, there was a nest with four precious blue eggs. I took photos the past three days and hope to keep snapping them until the little guys fly away. 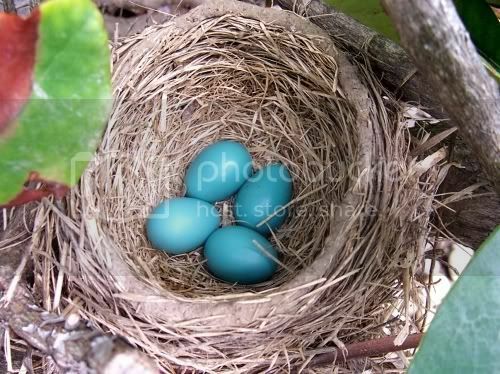 Or until the mama robin pecks my eyes out. Lol. Obviously, it is going to be a little boring until something happens, but I had all the pics, so I posted them. Oh how adorable it will be!! Ive got barn swallows up in the corner under my patio (right as we walk out our door to the back yard they fly away) but they have been there year after year since we have been here. I eve saved the mama's life as she was stuck in horse hair that she used for her nest. They always have babies there and of course it gets dramatic when they start trying to fly and stay away from my doggies. Good luck and have fun with watching the robins! Such a beautiful blue. I hope Mama robin doesn't mind the daily photo snapping. Keep us updated Amy! Oh how great to have a front row seat to the hatching of the babies.I'm so green with envy.Have fun and I will be watching for updates. 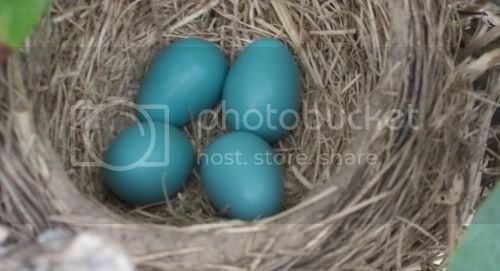 What a wonderful colour those eggs are. Let's hope they all hatch and that the young ones survive.